CAGE WARRIORS Fighting Championship is pleased to confirm that it has penned deals with Premier Sports and Setanta Sports, which will see the broadcasters carry all CWFC events for the remainder of 2013. Ronnie Mann (21-6) has signed a multi-fight deal with Cage Warriors Fighting Championship (CWFC) that will see the bantamweight back in action on July 20th at Cage Warriors 57. Pat Curran and Joe Warren promised fireworks in their main event Featherweight Title Fight, but it was Curran who stopped the former Champion Warren in one of the most entertaining Bellator bouts seen in recent memory. Richard Mann breaks down the main card for Bellator’s sixth season premiere which airs tonight LIVE on MTV 2 and features Joe Warren defending his featherweight title against Pat Curran in the main event. 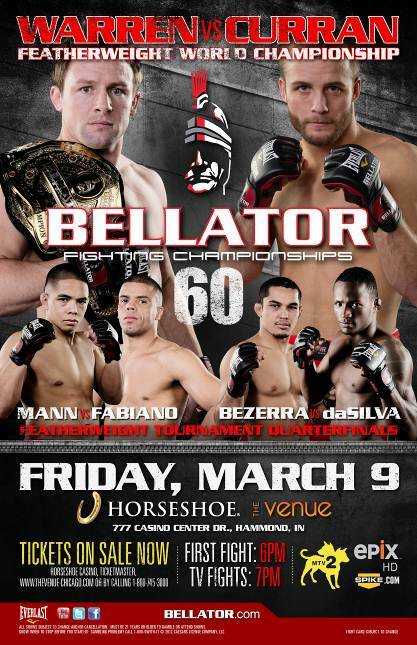 The weigh-ins for Bellator 60 took place Thursday afternoon at Hammond’s Horseshoe Casino in Hammond, Ind., the same location that will host Friday’s card headlined by Joe Warren vs. Pat Curran in a Featherweight Title bout. 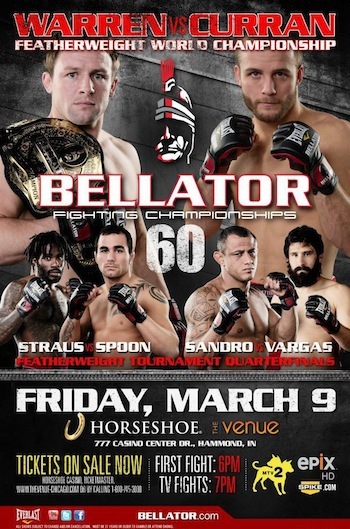 As Bellator prepares to start its explosive sixth season, the fight card for Bellator 60 has been finalized with a number of preliminary fights featuring explosive local talent sure to make the Chicagoland area proud. Bellator welterweight champion Ben Askren will put his title and undefeated pro MMA record on the line when he faces season five welterweight tournament winner Douglas Lima at Bellator 64. There were eight at the start but after Bellator 53 in Miami, OK, just two men remain in the Bellator Season 5 Welterweight Tournament. Fighter weigh-ins for Bellator 53 took place Friday in Miami, Okla., at the Buffalo Run Casino, the same location that will host Saturday’s fight card, which will air LIVE on MTV2 at 9 p.m. ET.